QUESTION: Why is the Caliber Convertible Cutter Rig™ considered a safety feature? 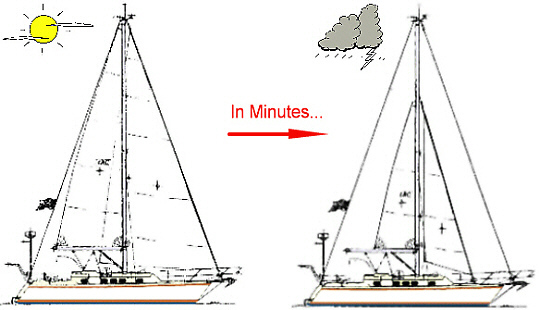 ANSWER: While cruising, if heavy weather is encountered, the Sloop Rig can instantly be converted into a heavy air rig that is self tacking. This can be done in a matter of minutes! Creating a well balanced and totally inboard rig that is strongly supported. Sail plan that is efficient and easily tacked for light to moderate winds. Sail plan is strong, perfect balance, self-tacking for heavy to storm winds. “There are many advantages to the cutter rig for general-purpose singlehanding. The cutter provides a three-sail rig for easy management, but with only one mast. Sail is more centralized or concentrated amidships as compared with other rigs. This increases safety, because there is a wide working space with minimal motion near the mast, and the crew seldom has to venture onto the boat's extremities in heavy weather. Also, the mast amidships provides a wide base for efficient staying, while its weight in that location has a favorable effect on the moment of inertia to help alleviate extreme pitching.